All of the apps below are free, but may require paid services to control. I haven’t necessarily been able to test all of the apps below, due to services I do or do not subscribe to. Each of the applications listed below can be downloaded by clicking thru and scanning the QR code with a barcode or QR reader. 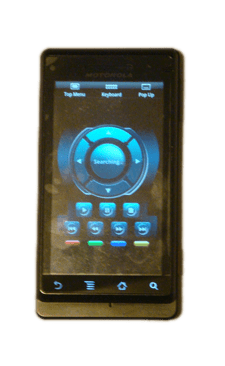 DIRECTV – If you are a satellite tv subscriber, you can control your DirecTV DVR directly from your Android phone. Fios Mobile – If you have Fios and use the Fios DVR, you can program and manage your Fios DVR, using this app to find and record new shows, view lists of upcoming recordings and recorded shows. Fios Remote – Control your Fios set top box directly from your phone. Change channels, control the volume, and view pictures on your Fios controlled TVs directly from this app, if you have a Droid or Imagio phone. Gmote – Installing the server on any Windows, Mac or Linux PC and this application on a phone will allow you to control the PC via wifi. My favorite feature of Gmote is the ability to play media files from the PC on the phone, including mp3 sound files and mp4 video files. PhoneFlicks – Remotely control and manage your Netflix queue. Look up and rate movies, add and remove movies from your queues and rate movies. The only thing missing is the ability to stream your instant queue to the phone. pocket Blu – If you are watching a pocket Blu enabled Blu-ray disc, you can control it directly from this application. The app also allows you to see what is currently playing and where in the movie’s timeline you are and gives an on-screen keyboard to assist with the Blu Live features. RemoteDroid – Another application to control your Mac or PC from the Droid. Although RemoteDroid is not as full featured as Gmote, the server does not have to be installed on the computer, just downloaded and executed. SqueezeControl – My friend Scott uses a Squeezebox to control his music, and his controller of choice is this app on his Droid when he listens to music and to transfer songs directly to his phone. TivoRemote – With a Tivo Series 3, Tivo HD, or Tivo HD XL, you can remotely schedule your Tivo to record your programs. TunesRemote – If your music program of choice is iTunes or you use an AppleTV, then you can control them as if you had the iPhone remote app. Perfect for those who use either to control their personal media for home listening. Droid Commander Lite – Control the camera, phone, forward text messages, and view media stored on the phone via sms text message or web browser. Plus the ability to make your phone ring and to track it in case it is lost. Are there other things you’d like to see the Droid phone control? Are there things you can control with your phone that I didn’t list above? any other types of apps you’d like to know about? Let me know below.